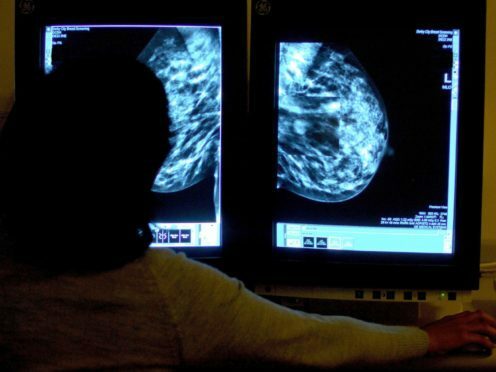 The findings will lead to a “fundamental change” in the way the disease is treated, a leading oncologist said, with an estimated 3,000 to 5,000 UK women likely to avoid chemotherapy every year as a result. Charity Breast Cancer Care said it was a “life-changing breakthrough”. Around half of these patients would historically receive chemotherapy after having surgery to remove their tumour, to prevent recurrence of the disease. However, the results of the TAILORx trial show that only 30% of women with this particular form of early-stage breast cancer benefit from the treatment. The study, presented at the American Society of Clinical Oncology (ASCO) annual meeting in Chicago, is thought to be the largest breast cancer treatment trial ever conducted. The TAILORx trial used the Oncotype DX test, currently available on the NHS, which allows doctors to predict the likelihood of the breast cancer returning. Patients with a recurrence score of up to 10 out of 100 have previously been shown not to benefit from chemotherapy, and instead need only hormone treatment. Those who score 26 or higher on the scale do benefit and currently receive chemotherapy. The TAILORx study, led by the Montefiore Medical Centre in New York, found women older than 50 with this form of breast cancer and a score of up to 25 did not need chemotherapy. Under 50s with a score of up to 15 can also be spared the treatment and only receive hormone therapy drugs after surgery, according to the research. Nine-year survival rates were 93.9% without chemotherapy and 93.8% with chemotherapy, the study found. Dr Ring said the trial’s reuslts would likely have an immediate impact on UK practice and represented a significant shake-up in the treatment of early-stage breast cancer. “It is a significant step because it is about avoiding a treatment that, for most people diagnosed with cancer, is what they all fear being suggested to have,” he said. Rachel Rawson, clinical nurse specialist at Breast Cancer Care, said: “This life-changing breakthrough is absolutely wonderful news as it could liberate thousands of women from the agony of chemotherapy. “Every day, women with certain types of breast cancer face the terrible dilemma of whether or not to have the treatment, without hard facts about the benefit for them. Baroness Delyth Morgan, chief executive of Breast Cancer Now, said the “landmark study” was “fantastic news”. “This is another significant step towards personalised breast cancer treatment and we hope these practice-changing findings will now help refine our use of chemotherapy on the NHS,” she said. The Oncotype DX genetic test has been available on the NHS since 2013, but the National Institute for Health and Care Excellence (Nice) is currently updating its guidance on whether it should be recommended for use. Dr Ring said the publication of the trial results was “timely”, adding: “I would be very, very keen that the TAILORx results are incorporated into that evaluation. Breast Cancer Now also called for Nice to reflect the findings in its guidance. “With the recent consultation on tumour profiling tests having already closed, it is crucial that Nice has the opportunity to consider these results as soon as possible,” Baroness Morgan said. Commenting on the findings, Dr Harold Burstein, ASCO expert, said: “This is the most common form of breast cancer in the United States and developed countries and the most challenging decision we make with these patients is whether or not to recommend adjuvant chemotherapy with all its side effects and with its potential benefits. The study of 10,273 women, led by Dr Joseph Sparano, associate director for clinical research at the Montefiore Medical Centre, is published in the New England Journal of Medicine.